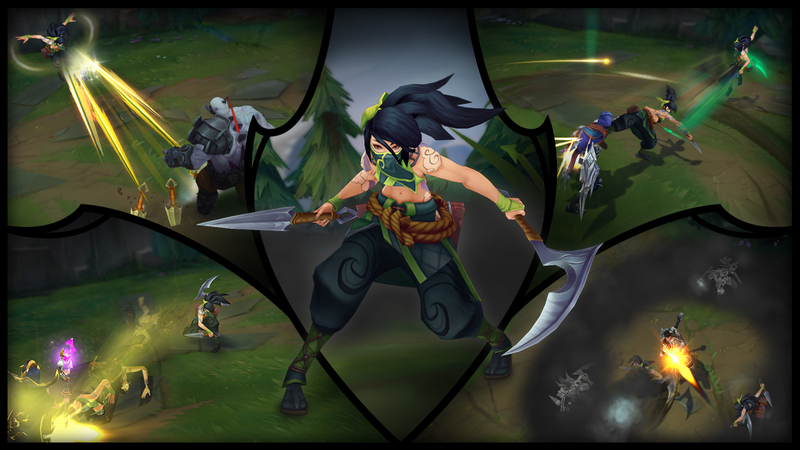 Get ready for Akali, the Rogue Assassin, a formidable killing machine trained to be constantly on the move as she takes down her opponents while swiftly moving in and out of the shadows! The secret to Akali’s technique lies in Assassin’s Mark which creates a deadly ring around an enemy hit by her; constantly crossing in and out keeps her kama swinging and gives a damage boost. Shuriken Flip allows Akali to hit her enemies while backing away from them while Perfect Execution tags her target with the Mark as she dashes forward or backward, activating her empowered kama. Five Point Strike lets Akali throw five kunai in a narrow arc for a lethal burst attack and in the same time heals herself for a percentage of the dealt damage. Twilight Shroud helps Akali reposition and keep her position hidden at the same time. It can be used in combination with Akali’s other abilities to set up, cross into, and slip back out of the ring of smoke. Even if she runs out of energy and enemies attempt to exploit her mistake, clever use of Twilight Shroud will keep them grasping at shadows.